Gadabouts Catering has been operating for well over two decades and they cater up to 50 weddings every year—sometimes 4 weddings happen in one weekend! It wasn’t Eileen’s intention to get into catering but she stumbled upon this path when the idea of being a social worker didn’t pan out. Now she’s saving the world with delicious food and well-planned events! After buying a second home in the mountains of Boone, NC they decided to make the High Country their permanent residence. So, they picked up and moved the catering business while still planning to service events all over the region. When Gadabouts Catering was in Charlotte, NC they mostly focused on corporate catering, however, they transitioned to also focusing on weddings after relocating to the Boone area. Her favorite part of the process is working closely with couples to help make their dreams a reality. Eileen believes that food reflects the personal tastes of the clients they work with. Your food can be a part of the wedding story, too! I’ve had the pleasure of working with their AH-MAZING team on a number of different occasions on everything from weddings to networking events. The team is comprised of a dedicated group of folks that want to create an awesome experience for clients and guests. Eileen is one of the hardest working women that I know. Seriously, I can’t keep up with her! It takes a TON of work beyond just choosing a menu to pull off feeding 200 people seamlessly but they do a great job of making it look easy! I’m excited to share this behind-the-scenes interview about how and why Gadabouts Catering got started. I’m the accidental caterer–I was planning to save the world as a social worker, got discouraged with my boss and then found a job with a catering company. I found I loved planning menus, planning events, and weddings–met my husband as he was the chef at the other company, and the rest is history! We started our own catering and event planning business in 1990, relocated to the NC High Country in 2004 and have made folks happy with delicious food and well-planned events ever since! In Charlotte, we were primarily a corporate caterer…there is virtually little or no corporate business in this area, so weddings became our main focus. We do up to 50 weddings each year, some weekends we will have four events! Each one is planned and executed flawlessly with the talented and tireless crew we work with! Planning–finding out the dreams and expectations of our couples–and then making those plans and dreams a reality. Coordinating all the components of the package! A caterer now, to be a successful WEDDING caterer, must be a wedding planner, designer, chef, delivery company and much more! How do you think catering can be used to tell a unique wedding story? When the food reflects the personal tastes of the bride and groom, it tells so much about the couple! I caution folks to not do only vegetarian when that this their personal preference, but we can create unique vegetarian dishes as well as meat dishes to tell their story…foods that reflect a certain heritage–maybe an Irish Lass is marrying a young man with German heritage–choosing foods to reflect both of these backgrounds…it is all in the story, isn’t it! Don’t get so overinvolved with the wedding that you forget about the marriage–the wedding is only a few days, marriage is for a lifetime. Wayfaring Wanderer, of course! 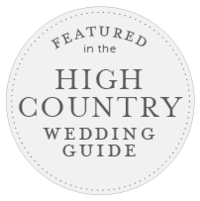 Also several venues–Leatherwood Mountain, Grandfather Vineyard, Valle Crucis Vineyard…Ugga Mugga Bakery and Hallmark Cakes…each of our florists is so special–Fuschia Moss, Shady Grove Gardens, Desi’s Floral & Design Studio. Everything! But specifically the professionalism and the obvious love that you and your hubby have for what you do–it reflects in the finished product as well as the atmosphere of the wedding!